Forward to 7C Diagnostic Approach to Staging NSCLC . Back to 7A The Numbered Staging System . I’m trying to give up sexual innuendos, but it’s hard… so hard. T – the size and position of the tumor. N – the presence of spread into the lymph nodes. M – the presence of metastases or ‘secondary’ lung cancer. Each category is qualified by a number. A small localized lung cancer that has not spread will be a T1, N0, M0. T1a – the lung cancer is smaller than 2 cm and is localized to the lung. T1b – the lung cancer is between 2 and 3 cm and is localized to the lung. T2 – the lung cancer is between 3 and 7 cm or has grown into the main bronchus, more than 2 cm below the carina. Or, the lung cancer has invaded the pleura. Or, the lung cancer has obstructed the bronchus and is associated with lung collapse. T2 lung cancers that are 5 cm or smaller are T2a; those larger than 5 cm are T2b. T3 – the lung cancer is larger than 7 cm or has grown into the chest wall, the diaphragm, the pleura, or the pericardium or is associated with lung collapse or there is more than one tumor nodule in the same lobe of the lung. T4 – the lung cancer has invaded the mediastinum, the heart, a major blood vessel, the trachea, the carina, the spine, the esophagus, the laryngeal nerve, or there are tumour nodules in more than one lobe of the same lung. See! They all say size isn’t important, but in this ‘T’ staging, it’s all about size. The only ‘T’ I’m interested in is the milk and two sugars kind! N0 – there is no lung cancer in any lymph nodes. N1 – there is lung cancer in the proximal lymph nodes. N2 – there is lung cancer in mediastinal hilar lymph nodes, but on the same side as the affected lung or there is lung cancer in carinal lymph nodes. N3 – there is metastatic lung cancer in lymph nodes on the opposite side of the chest, in cervical or apical lymph nodes. M0 – the lung cancer has not spread to another part of the lung or any other part of the body. M1a – lung cancer has spread to both lungs, or there is a malignant pleural or pericardial effusion. M1b – there are lung cancer metastases to distant sites such as the liver or bones. If at first you don’t succeed, then sky-diving is not for you. The main aim of a staging system is to define patient prognosis, but there are other uses. There is a requirement for a common nomenclature (naming of terms for lung cancer) for patient groups that may form a ‘directive’ or ‘algorithm’ (set of rules) for patient treatment. 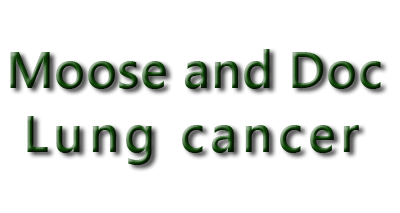 The International Association for the Study of Lung Cancer ( IASLC) Lung Cancer Retrospective Staging Project produced recommendations for the International Union Against Cancer (UICC) and for the American Joint Committee on Cancer (AJCC) that led to the production of the 7th edition of the TNM classification system for lung cancer. The International Staging Committee of the IASLC launched a Prospective Lung Cancer Staging Project in May 2009. The IASLC project was designed to assess the validity of each component of T, N, and M and the other factors relevant to lung cancer staging and prognosis. The development of the 2009 revised staging system for Non-Small Cell Lung Cancer (NSCLC) by the IASLC International Staging Committee involved a large amount of international collaborative work and data analysis. This revised staging system was developed with evidence-based data; that is why there are so many staging subgroups. These staging subgroups were determined using ‘outcome measures’ of ‘overall survival‘ (OS). Remember, when looking at ‘Overall Survival’ statistics, an individual prognosis is equally as important including factors such as overall health and mental attitude. Yeah, these are just statistics and 50 % of people don’t like statistics. Figure 7.7 Overall Survival (OS) According to Tumor Size (T). (Modified from: Detterbeck et al, 2009). Over time, there are factors that change the approach to such ‘treatment groupings.’ For lung cancer, new treatment approaches are rapidly developing, and these may affect patient prognosis. There are also advances in imaging that may affect how a stage of cancer is given to a patient. The implementation of lung cancer screening and tumor detection (e.g., by LDCT screening) can alter the range and types of lung tumor that are diagnosed. The IASLC lung cancer staging system has been developed to meet the requirement for a common lung cancer staging nomenclature. An important part of patient prognosis includes an emphasis on histopathologic lung tumor staging; clinical staging is more practical because it can guide treatment decisions from the start. It must be remembered that the present cancer staging systems are anatomically based. In the future, refinements or new staging systems may include biological behavior or gene profiling. What’s the difference between Clinical and Pathological Staging? Clinical staging is based on imaging and examination techniques whereas pathological staging is used after biopsy tissue testing. Figure 7.8 Overall Survival (OS) According to Lymph Node Involvement (N). Clinical observations have indicated that there may be distinct types of biological behavior that affect lung cancer prognosis in patients. There are lung cancers that are characterized by a tendency to spread to regional lymph nodes. There are lung tumors that are characterized primarily by direct local invasion. There are lung tumors with a tendency to develop additional foci of cancer within the lung. There are lung tumors with a tendency for systemic metastases. The American Cancer Society (ACS) has produced a summary of the AJCC 7th Edition Lung Cancer Staging: To view this summary click here. TX The primary tumor cannot be assessed, or a tumor is proven by the presence of malignant cells in sputum or bronchial washings but is not visualized by imaging or bronchoscopy. T1 Tumor < 3 cm in greatest dimension, surrounded by lung or visceral pleura, without bronchoscopic evidence of invasion more proximal than the lobar bronchus (i.e., not in the main bronchus). Involves main bronchus, > 2 cm distal to the carina. Associated with atelectasis or obstructive pneumonitis that extends to the hilar region but does not involve the entire lung. Chest wall (including superior sulcus tumors), diaphragm, phrenic nerve, mediastinal pleura, parietal pericardium. Tumor in the main bronchus < 2 cm distal to the carina but without involvement of the carina. Associated atelectasis or obstructive pneumonitis of the entire lung. Separate tumor nodule(s) in the same lobe. Mediastinum, heart, great vessels, trachea, recurrent laryngeal nerve, esophagus, vertebral body, carina. Separate tumor nodule(s) in a different ipsilateral lobe. What a lovely word, ‘ipsilateral’. Ipsilateral refers to lymph nodes on the same side as the tumor, whereas contralateral refers to the opposite side. Figure 7.10 Diagram of the Lymph Node Stations, 1 to 6. Figure 7.11 Diagram of the Lymph Node Stations, 7 to 14.